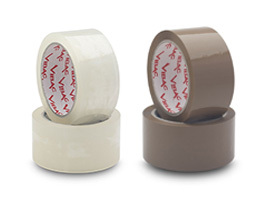 58 µm Water based Acrylic Box Sealing Tape for demanding applications requiring low noise unwindings and high tack. Acrylic Carton Sealing Tapes are the best solution for reliable, all-temperature and all-weather box sealing performance. Designed for applications requiring excellent clarity and projects where resistance to aging, weathering, UV light and yellowing are important. Top quality acrylic adhesive provides higher shear strength and superior quick stick performance while controlled unwind facilitates dispensing operations on manual or automatic case sealing machines.